In the battle for first place, Japan's tough pitching proved the difference as they blanked the Koreans on a two-hit shutout for the 4-0 triumph. 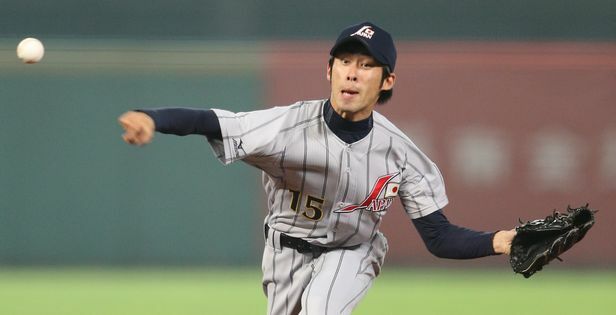 The big win against their arch-rival enabled Team Japan to top the table for first place through Day 4 at the 26th BFA Asian Baseball Championship, which is being held at the Taichung Inter-Continental Stadium in Chinese Taipei this week. In this showdown for first place, Japan scored one run each in the 2nd, 3rd, 8th, and 9th innings on a total of 10 hits and 4 walks. The Koreans could not get anything against the three Samurai Warrior pitchers, with RHP Kentaro Yoshinaga, RHP Ryo Akiyoshi, LHP Junichi Katayama combining to shut down the opponent on two hits and 11 strikeouts. With this latest victory, Team Japan is a perfect 4-0 in four games, while Korea sits in second place with a record of 3-1. The dominant Japanese pitching only gave up one lone run through their four contests, in edging the host Chinese Taipei 2-1 in opening day action. Thereafter, the Samurai Warriors went on to defeat Pakistan 13-0, and 1-0 over the Philippines, then the latest 4-0 triumph over Team Korea. Japan will face China for their final game this weekend. If they win against China, then for their perfect 5-0 record, the reigning champions Japan will retain their BFA Asian championship crown for the fifth time in a row. Third place is Chinese Taipei, with two wins and one loss (12-1 over Philippines, 15-0 over Pakistan, and one defeat to Japan 2-1). Chinese Taipei's scheduled encounter against China on Day 3 was rained out, with the game postponed to Monday. China is also in third place possessing a 2-1 record, followed by Pakistan and Philippines as both teams have four losses and no win in the tournament thus far.